Ocean Guides provides boat and scientific support services for expeditions, conservation projects and academic research. Our vessel, Boreas (the north wind), a 7.9m Cheetah Marine Catamaran, was fully refitted in 2016. It is tough and highly manoeuvrable boat, with a forward wheelhouse and spacious aft deck. Powered by twin 90hp outboards the boat will comfortably sit at 20 knots allowing rapid and efficient transit between islands and features of interest. The vessel has large inboard fuel tanks and has an approximate fuel range of 140 nautical miles, at 20 knots. The vessel operates under a Maritime Coastguard Agency Small Commercial Vessel Certificate and is certified to work in Category 2 areas i.e. 60 miles from safehaven, with 8 persons aboard or combined persons and cargo of 900kg. This certification process requires a continuous schedule of checks and maintenance on the boat and its inventory and crew members require relevant qualifications and certificates of good health. The layout of the vessel was designed to support island hopping and scientific survey. 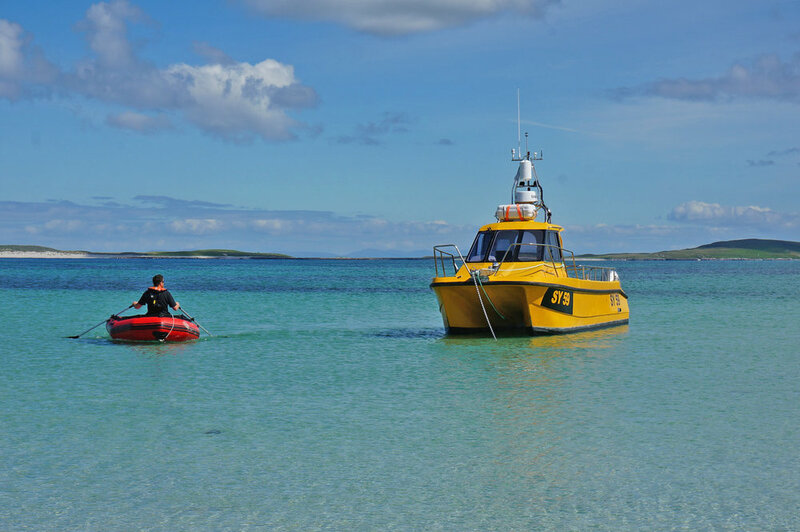 It has a workman-like quality, rather than that of a showboat, and has additional features including onboard computer systems, 2+3d sonar, GPS weather station with rate compass, underwater cameras, seabed sampler, temperature/salinity/DO profiler, hydraulic winch and roller, 2 inflatable dinghies (one with 40hp outboard), dive ladder etc. We can also provide fishing hand lines and quality rods & reels ... for your lunch breaks ! The vessel can also be easily transported to other locations by road if required. For this we have purpose built trailer and vehicle with a 3.5t towing capacity. Please Contact Us for further information and contract hire Terms and Conditions.